It’s rare that the launch of any product by Apple does not coincide with a good amount of ballyhoo – and the new Apple laptop, the MacBook Pro with Retina Display, is no exception. The laptop brings with it an induction into the land of the lappy a stellar new screen technology called Retina Display – and it has taken clear clues, aesthetically, from the MacBook Air and Pro – and even the third iPad – concluding in quite the Mac Daddy. What sets this doodad apart from any other, is a conglomeration of new design features and boosted specs that you will not find on any other “Mactop” – including a body that is waifish enough to make the cut considering today’s ultra-thin standards (albeit not as anorexic as you would presume considering its weight, which I will discuss a bit later), a quad-core processor, a mega high-res display, and HDMI. The new Macbook with Retina Display starts out with Intel’s third generation Core i-series processors known as Ivy Bridge – but the real star of the show here is the new Retina Display, of course. So, let’s talk numbers: the upgraded resolution is 2,880 X 1,800 pixels, which results in a level of crispness and clarity that really will make this device the “apple of your eye” – and in fact has never been viewed on any other laptop, ever. For perspective: right now, the highest standard resolution you will find on Windows machines is only 1.920 X 1,080 pixels – the same resolution on HDMI. Sounds impressive, yes? There’s more: The pixel density is an astounding 220 ppi – that equals less than that of either the iPhone 4S or the iPad. And you can cross “awkward viewing angles” off your list of things your worried about having to deal with in your next laptop – viewing angles on this Mac have been expanded so that the frustrating plummet in contrast is virtually a thing-of-the-past and you can see your screen, clearly, from pretty much every angle. Not convinced yet? How about it if throw in glare-reduction…because they’ve managed to do that, too (a feature which will probably be the staple for sucessive devices). 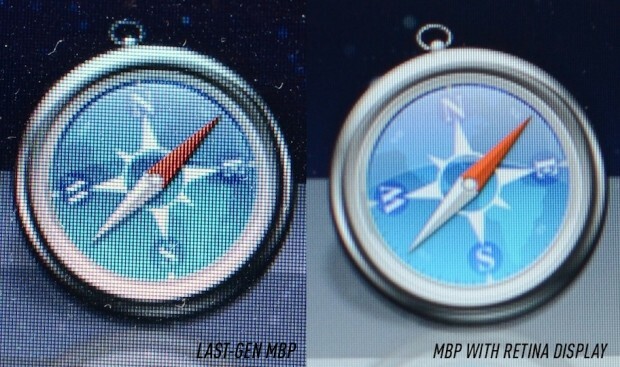 Courtesy of our geeky friends at Mashable.com, you can check out more of these stunning comparisons by clicking here. The new MacBook Pro really is in a league of its own because it is not an Ultrabook, nor a midsize laptop – rather is takes cues from both models and squishes them into a cozy, entirely new hybrid of the Apple that Goldilocks may very well deem “just right”. While it is 0.71 inches, which is almost as thin as the MacBook Air, it is heavier than one would desire, though – at 4.6 pounds. So, if you are one of the majority of people running around like a headless chicken on a routine basis, you may want to consider whether lugging around something the size of a newborn preemie all day long is a sacrifice you are willing to make. But if being able to brag about being the proud parent of a bouncing baby…MacBook… is your thing, then make a go for it. Another plus with this new model, is that owners of the new Apple will not just be holding hunk of metal in their hands – but a bit of the future as well. Now that the new Retina Display technology has graced the Pro, the iPhone and the iPad, well, naturally other tech developers are going to have to follow suit. Apple is a pioneer, a trailblazer and trendsetter in today’s world – it would be a technological suicide for companies not to work on gracing their products with the new technology ASAP – in fact, they probably should have started, like, yesterday. Aside from the Retina Display, the HDMI is likely to knock some socks off, too. The 2.3 GHz quad-core Core i7 CPU and NVidia GeForce 650M GPU are reminiscent of a batch of Ivy Bridge gaming laptops that have launched which also had quad-core Core i7 Ivy Bridge CPUs with new Nvidia GPUs. However, the fact that those machines seemed straight out of Bedrock with massive 17-inch desktop compositions and crappy battery life makes me all gawky-eyed to think about all of that super power shrunk into a sleek, handsome portable machine known as the new MacBook Pro with Retina Display. Catch me if I swoon. In terms of hardware, you will not find an Ethernet port on the new Pro – rather, the laptop comes equipped to support a Thunderport adapter which consumers have to purchase separately for about 30 bucks. Similarly, a FireWire 800 port has been jettisoned for a separate Thunderbolt adapter. So go ahead and grieve, traditionalists, but be quick about it, because in the long run, the Thunderbolt is probably going to become your next best friend – and fast. And by the way – you won’t have to wean yourself off of the old stuff completely – Apple has left two USB 3.0 ports on the machine, so you can take baby steps towards getting the most out of the latest iRevolution. Just how much juice can you squeeze out of this Apple? Well, it depends on whether or not you purchase the no-frills 2.3 GHz, the more robust 2.6 GHz quad-core Ivy Bridge CPU or the lightening-quick 2.7 GHz model (which can be made-to-order at an additional cost). According to Engaget.com , “We ran all the major benchmarks and saw some big, big numbers. For the 2.6GHz model, Geekbench gave us an average of 11,591 — that crushes the 9,647 we scored with the last MacBook Pro, which is itself far from sluggish. The new 2.3GHz model wasn’t far behind with a score of 11,082. Xbench was similarly close: 486 for the higher-spec’d model, and 457 for the lower. Finally, the SSD delivered write speeds hovering around 390MB/s and reads topping out at 440MB/s.” That sounds like some decent power, any which way you go about this Pro. When the new laptop is launched, look to CPS for providing your piece of the future with an extended warranty – along with any accessories you may want to complement it with.